Peoplewatchingand being watched by peopleat Les Deux Magots. Les Deux Magots is one of Paris' most famous (and most touristy) cafés, but it's a fun scene to sit and have a coffee out front if the weather's good. Located in the formerly artsy and now trendy and espensive Saint-Germain-des-Prés area, Les Deux Magots is mostly famous for its prestigious clientele over the years, including Hemingway, Sartre, Picasso, Camus; the list goes on and on (but is mostly filled with dead French guys you and I have never heard of). It's a cool feeling to sit and have a coffee and think about the brilliant folks who used to used to do the same thing in the same place. You can also order lunch or dinner at Les Deux Magots, but like I say about all expensive-slash-touristy cafés in Paris, in my opinion is you're better off just having an overpriced coffee and enjoying the experience of the place, and then get out of there and spend your real money in a great restaurant in a less-expensive part of town, where real Parisians eat. But hey, if you can afford it and want to give it a try, go for it! 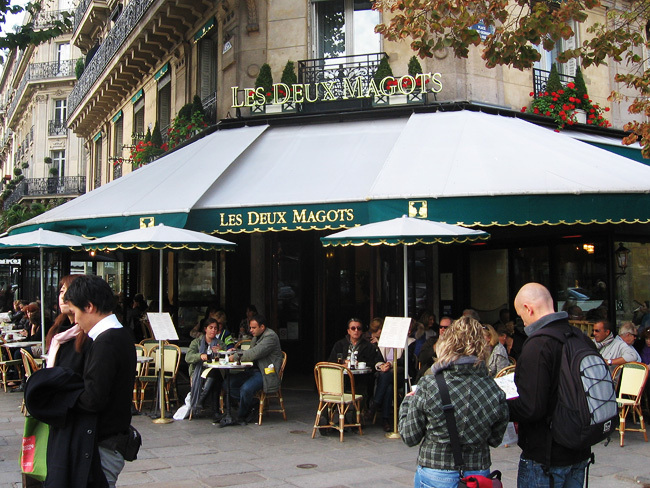 The name of the Les Deux Magots is pretty strange to anglophone eyes, and I get questions about it pretty frequently. So, just to be perfectly clear, the word magot (pronounced "mag-oh" -- the T is silent) is a kind of monkey  a barbary macaque to be precise  and not a maggot! Ha! However, perhaps even more strangely, the café is apparently named not for monkeys for but for two wooden statues of Chinese merchants that make up part of its interior decor — I don't know the history behind this usage of the term, and I kind of don't wanna! Yeesh!